Two trailers, Dark Knight Rises and The Avengers which is very low quality as it was leaked (which, as it is leaked means it might be taken down shortly). My question is which is better? Personally I feel that even though you can't see half the darn thing, The Avengers is better. And that's from someone who's anticipating Batman way more. While the Batman trailer is stylish, it's ultimately pretty empty. What do you think? I will have to check out both of those movies. Dude I love you in more ways than you can imagine!!!! Can't see the video now. Big Brother (Disney) has absconded with it. All I can think of with Batman is, "I wonder how everyone liked working with Christian Bale again?" They both seem kinda amatuerish to me. I really expected more than a guy dying on a gurney who I can barely understand tell me something I already know. Way to NOT build buzz Chris Nolan. I have a bad feeling about this one. I think Nolan is going to outsmart himself if that makes any sense. 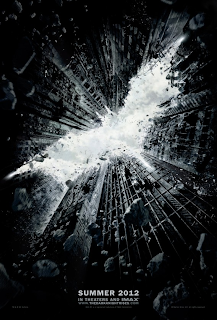 I saw the Batman trailer, and it looks pretty intriguing. Couldn't see the Avengers trailer, though....apparently it's been pulled. Can't see the second one, so I'm going with Batman. I probably would have anyway. The trailer really makes me want to see it.